Gene M., one of our super-swell readers who contributed the lost files of Ruth Welcome's "Zither Magic" album recently, has gifted us with another album called "Zither Magic" that couldn't be more different. 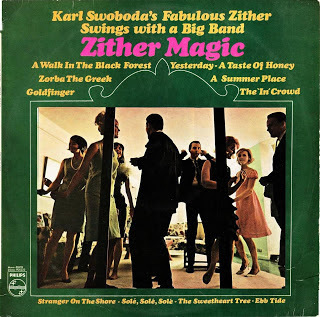 In contrast to Welcome's minimal one-(wo)man-band arrangements, old-world folkiness and classy '50s cocktail lounge feel, Karl Swoboda's "Zither Magic" is a big, brassy, fully orchestrated, swingin' Sixties album that reduces the role of the zither to a kind of almost surf-y lead guitar over twist/swim/frug-able versions of hit pop songs. Don't dread yet another version of "Yesterday" - this one swings like a rusty gate, dad, played at a breakneck tempo that Mr. McCartney probably never envisioned. "Theme From A Summer Place" could be a Dean Martin backing track. A beautifully dreamy "Ebb Tide" takes a break from the craziness to take us on a stroll down a lonely beach. "The In-Crowd" is wild enough to get Twiggy workin' that mini-skirt. Outta sight! Karl Swoboda - "Zither Magic"
Hey Mr Fab, 174 downloads on this the last time I checked stats! As if by magic, it's back.